Book 2 of the Secret Histories series. Having read the first book in this series, and Green's Nightside series (and really liking the Nightside series), I was excited to start this book. The last book seemed to be the start of a long adventure, but still self-contained. So, this book was a bit of the "I have just finished a grand adventure, I have power, what do I do with all this new power?" Well, you don't handle it well, you ignore those who supported you in your uphill battle, you do a lot of things wrong, and you become a jerk. 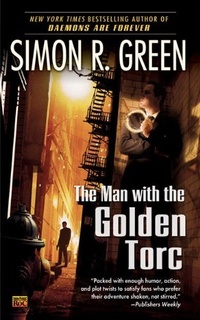 Based on how long-winded Green is in this book, and the reviews of subsequent books commenting about how the main character becomes cruel, I'm choosing not to continue reading this series. When I finished the first book, I was somewhat excited about this one. I'm not excited about this plot at all. I recommend the Nightside series over this one, by a long shot. Maybe this is an okay book to read if you're a Green fan, but I'm not sure. I don't recommend it. Leave your memories of Eddie with the first book. "When you work as a field agent, you learn pretty fast you can’t trust anyone." “Not even those close to you?” said Molly, studying me solemnly with her huge dark eyes. The truth might set you free, but there’s nothing that says you have to be grateful. Book 1 of the Secret Histories series. 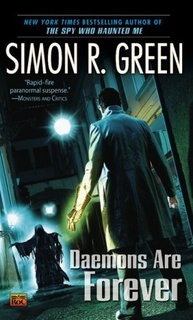 I enjoyed the Nightshade series by Simon R Green, so when Amazon suggested this book, I figured it would be a fun read. Of course, I didn't realize that the series was already like twelve books long. This book is a fun read. It's about Eddie Drood, of the Drood family, the secret entity protecting the world. Each member of the Drood family wears a gold-colored torc, a rigid "neck ring" made of metal, designed to be worn permanently. Wikipedia has a better description of torcs. The torc has the magical abilities to give its wearer extraordinary strength, protection from injury, and near impenetrability. The book starts out with Edwin being given a task by the Matriarch of the family, after Edwin describes just how much he hated growing up in the family. Family is family, so he accepts the task offered, and is subsequently attacked by legions of enemies. He spends the rest of the book figuring out WTH is going on. In the middle of it, he finds Molly, and together they continue to figure out what is going on. Like all modern fairy tales, OF COURSE they figure out what's going on. I enjoyed the book, even if I guessed wrong on the true purpose of the Matriarch's task. I thought it was to take out the Drood family's strong enemies. It wasn't. Still, a fun read.